Daycare can be a great experience for children. Good quality daycare centers have been shown to help kids improve their behavior, adapt to social conditions, and prepare for school. Daycare should be fun for kids as they are filled with games, toys, and story-time. Every day, parents drop their children off at the local daycare. Parents place high trust in these facilities to care for their children in the same way they would. Whether it’s a national chain or a small “mom and pop” facility, daycare centers have a responsibility to provide a safe environment for children. While we expect that growing children will get some bumps and bruises along the way, serious daycare injuries can result immense suffering for families. A child may be impacted for the rest of their life when a daycare center fails to provide the appropriate standard of care. Other children who remain in the care of the center may be at risk. Your injured child has rights. If your family has been impacted by a daycare accident, contact the personal injury lawyers at the Wolfson Law Firm. We represent the interests of families who have been injured in daycare accident. Call the Wolfson Law Firm at 305-285-1115 for a free consultation. Playground injuries – The playground is a great way for kids to exercise in the outdoors. Running, jumping, and climbing can improve motor skills, coordination, and burn off that extra energy. With the high volume of activity that happens on the playground, daycare centers should ensure that equipment is safe for children to use. Children can be injured if playground equipment is broken or in poor condition. Swing-sets with worn seats or chains can break when used. Broken steps, slippery surfaces, or weak structures can lead to falls. Exposed nails, broken wood or metal, or sharp edges can cause scratches and lacerations as children run by. Lack of child-proofing – Daycare centers should be properly child-proofed. Accidents can happen when shelves are not secured to the wall or are top-heavy and tip over. Hanging cords should be properly secured to prevent children from pulling down objects or getting entangled. Cleaning supplies must be stored in locked cabinets to prevent accidental poisoning or chemical burns. Electrical outlets need proper covering to avoid electrocution accidents. Poorly trained staff – Children have high energy and require a lot of patience. Daycare staff should be properly trained to understand and meet these needs. Staff working in a daycare center should be well-versed in the dangers that everyday items can pose to children. Lack of supervision can lead to injuries on the playground or within the facility itself. Allowing children to play with toys that have small parts or are broken can lead to choking hazards. Improper use of bottle warmers can cause burns to infants. Medical needs – Staff should be aware of a child’s allergies. Snacks provided to kids should be properly chosen to avoid potential allergic reactions to such items as peanuts, berries, or dairy. Daycare providers may also be required to administer medication during the day. Incorrect dosages can lead to injury. Leaving medicines out can also pose a hazard to children. Pools – Centers may offer inflatable pools on a hot day. Although water is shallow, there is a risk of drowning. Staff should closely supervise children in and around all bodies of water, whether it’s a pool or tub. Why Contact a Florida Daycare Accident Injury Attorney? As parents, we expect that our children will be safe at a daycare center. We expect that providers will properly care for and supervise our child. Although injuries at a daycare center may often be nothing more than minor cuts and scrapes, accidents that result in broken bones, sprains, and severe lacerations will require medical attention. Serious, and possibly fatal, injuries may occur due to hazards or lack of supervision. Drowning in small amounts of water, pulling down heavy objects that were not secured, choking on objects, or sticking forks or pencils into exposed outlets will result severe injuries that may impact a child for the rest of their life. 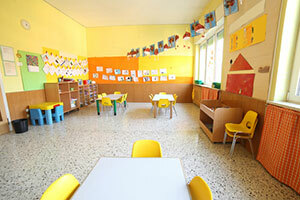 If your child has been injured at a daycare facility, you need to seek the advice of legal counsel. A severe injury will require immediate, possibly continual, medical attention. As a parent, it may be necessary for you to stay home and provide in-home care to your child. The high cost of medical care should not prevent your child from getting the help that they need. The daycare accident attorneys at the Wolfson Law firm defend the rights of families who have been impacted by daycare injuries. We can help families receive the compensation they need to cover medical bills, lost wages, and pay for continuing care. Contact the Wolfson Law Firm for a free and confidential review of your case at 305-285-1115. We have offices in Miami, Fort Myers, Fort Lauderdale and West Palm Beach. We defend the rights of injured victims throughout the state of Florida including the communities of Orlando, Tampa, Sarasota, Jacksonville, Miami Beach and the Florida Keys.